A postpartum doula is a non-medical professional who is trained to support families during the fourth trimester - the period of time in the few months following a baby’s arrival. Postpartum doulas help to ease the transition by offering a myriad of supports - including things like help with breastfeeding and post-birth recovery/comfort, referrals to community resources, evidence-based information, or even a helping hand with meal prep and light housekeeping. Postpartum doulas are your ally when navigating what can be an overwhelming and stressful time. We lend a non-judgemental ear, and offer whatever is needed on a moment-to-moment basis - be it information, encouragement, or simply someone to hold your baby so you can take a shower! Postpartum doulas are here for you first. Tell me more! Why are postpartum doulas important? Postpartum care in Canada is seriously lacking. 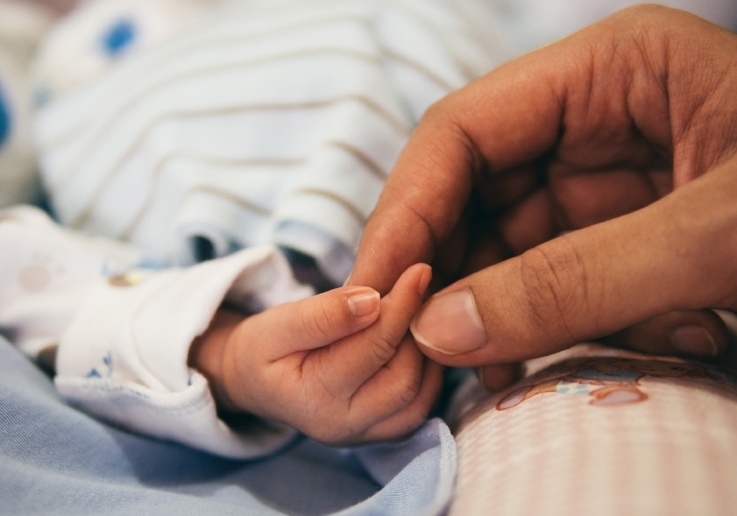 There is a gap in our continuity of care: families receive tons of support during pregnancy and then labour & delivery, but very few systems are in place to ensure a positive adjustment once the new little human is actually here. Parents often have little support, yet we expect them to know what to do, and to do it with a smile. The birthing parent may struggle with physical recovery, nursing, or just generally feeling happy and well. It doesn’t have to be this way! In other cultures around the world, traditional postpartum practices still exist. Countries in Asia, Latin America, and elsewhere recognize the importance of rest and support for the person who has given birth. That person isn’t expected to go about their normal daily routine; instead they set up camp in bed with their new babe, and their only job for several weeks (often 30-40 days) is to rest, recover, and feed the baby. Others step in and take care of all other duties. New parents are fully supported while stepping into their roles. I don’t know about you - but I think this is pretty awesome! We have a lot to gain from looking at these traditional practices and seeing how we can adapt and implement some of them in our Canadian homes. For those that like more scholarly reports, know that there is a huge amount of evidence surrounding the importance of support in the postpartum period. Here is one lengthy paper that discusses the value of postpartum doulas, in relation to maternal empathy and self-confidence. Postpartum doula care has been found to positively influence postpartum mood disorder rates as well as breastfeeding outcomes. Pretty great! Can't I just have my friends and family help me out? Yes, of course! It’s a good idea to use whatever resources you have available. This is the time to build your village of support people...and a postpartum doula makes a great addition to your village. Some folks may not be close (either physically or emotionally) to their families. Also, while friends and family have the best intentions, sometimes their visits can add more stress for parents (for example, if all they do is cuddle the baby, give advice, and ask for a cup of coffee). The beauty of postpartum doula support is that it’s unbiased, non-judgemental, and focused on your needs, not just baby’s. Postpartum doulas are not social visitors who need to be entertained - we’re here to delve into the messiness of this life-changing transition alongside you. We’re in the game. We’re your teammate, your cheerleader, and your coach. Why choose me as your postpartum doula? I believe it’s possible for you to have an amazing postpartum experience. Forget the noise for a moment - the noise of all the books you’ve read and everyone who’s warned you about sleep deprivation - and turn inward. Take a breath. I believe it’s possible for you to have an amazing postpartum experience. For your postpartum experience to be restful and rejuvenating, actually. Let’s nourish you and take care of you, so you can do the same for your baby. The postpartum period is traditionally considered a sacred time...and I’m all about bringing back the sacred. My background is in nutrition, so I have a special interest in using healing food as a staple of childbirth recovery, supporting energy and mood, and encouraging milk production. As your postpartum doula, I honour you, your partner, and your family. I know you’ve got this. My intention is to provide whatever is needed - hugs and high fives included - for you to have one of the best experiences of your life. Really. You are welcome to purchase a different number of hours, at a rate of $35/hour. You may purchase 24+ hours at a rate of $30/hour. Hours must be used within a 3 month period. Individual visits are a minimum of 3 hours in length, between the hours of 8am and 8pm. Combine with other services for 10% off. Other services offered include postpartum meal prep, placenta encapsulation, and belly binding. Not in Toronto? I also offer virtual support. Work with me from wherever you are! Are you ready? Book your free consult!